Philips Electronics has officially announced its new high-performance Philips Xenium X713 dual SIM phone, which is equipped with Dual-SIM technology, as well as works in GSM 900/1800/1900 MHz, offering users quick access to GPS features by simply tapping on button, WAP 2.0/XHTML browser, and stereo FM radio. In addition, Philips Xenium X713 also comes with 3.2-inch resistive touchscreen display, 3.2-megapixel autofocus camera with LED flash, and including a powerful 1530 mAh Li-Ion battery that providing up to 12 hours. 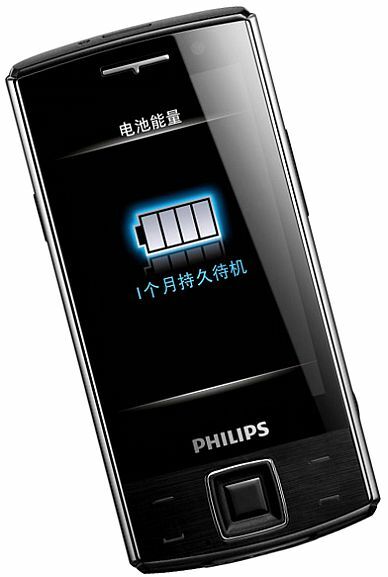 The new Philips Xenium X713 mobile phone measures 54.8 x 113.3 x 14.5 mm and weighs only 126.5 g is expected to be available in first quarter 2011 but no words on its price yet.